Dr. Meng Wang a former graduate student in the laboratory of Dr. Bohmann, has been named a Howard Hughes Medical Institute (HHMI) Faculty Scholar, a grant awarded to outstanding young scientists and researchers who have made impressive accomplishments and have a bright future in making groundbreaking contributions. Dr. Wang is currently an associate professor at Baylor College of Medicine, where she studies the influence of endocrine and metabolic functions on aging, using C. elegans as a model system. Researchers from Wilmot Cancer Institute and Roswell Park Cancer Institute in Buffalo reported in the journal Oncotarget that they have discovered a possible new tool for predicting whether prostate cancer will reoccur following surgery based on the expression patterns of four genes. Some prostate cancers grow very slowly, and when the disease is detected early, the five-year survival rates are nearly 100 percent. However, some men are diagnosed with more aggressive localized disease and, even after having a radical prostatectomy, cancer will return in one-third of patients. Hartmut “Hucky” Land, Ph.D. (left) and David C. Linehan, M.D. 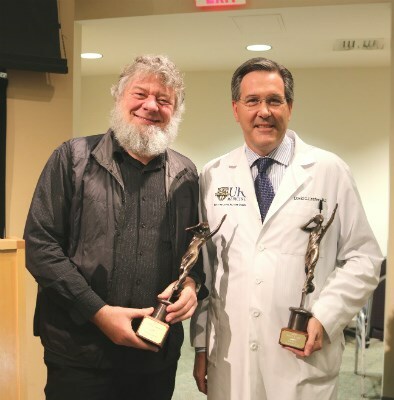 Wilmot Cancer Institute’s co-directors Hartmut “Hucky” Land, Ph.D., and David C. Linehan, M.D., were recognized recently with the Davey Award, an honor bestowed on University of Rochester faculty members who have made outstanding contributions to cancer research. They received their awards at the 21st annual Wilmot Scientific Symposium Nov. 10. The award for Land, who organizes the annual symposium, was a surprise orchestrated by Jonathan W. Friedberg, M.D., M.M.Sc., director of Wilmot Cancer Institute. At the symposium, Land presented the planned Davey Award to Linehan, who is also Wilmot’s director of clinical operations and the Seymour I. Schwartz Professor and Chairman of Surgery. Linehan was recognized for his work studying the role of the tumor microenvironment in promoting treatment resistance in pancreatic cancer. Before his lecture, Linehan presented Land the surprise award with a recorded video message from Friedberg. Land, who is also Wilmot’s director of research and the Robert and Dorothy Markin Professor of Biomedical Genetics, was recognized for his body of work and for his work studying the genetic programs that control all of cancer’s worst shared features — such as a cancer cell’s ability to quickly divide and survive despite aggressive treatment. Researchers at the University of Rochester Medical Center believe they have identified a new means of enhancing the body’s ability to repair its own cells, which they hope will lead to better diagnosis and treatment of traumatic nerve injuries, like those sustained in car accidents, sports injuries, or in combat. In a study published today, the team showed that a drug previously approved for other purposes can ‘wake up’ damaged peripheral nerves and speed repair and functional recovery after injury. The study appearing in EMBO Molecular Medicine, demonstrates for the first time that 4-aminopyridine (4AP), a drug currently used to treat patients with the chronic nerve disease, multiple sclerosis, has the unexpected property of promoting recovery from acute nerve damage. Although this drug has been studied for over 30 years for its ability to treat chronic diseases, this is the first demonstration of 4AP’s benefit in treating acute nerve injury and the first time those benefits were shown to persist after treatment was stopped. Study authors, John Elfar, M.D., associate professor of Orthopaedics, and Mark Noble, Ph.D., Martha M. Freeman, M.D., Professor in Biomedical Genetics, and their laboratory team, found that daily treatment with 4AP promotes repair of myelin, the insulating material that normally surrounds nerve fibers, in mice. When this insulation is damaged, as occurs in traumatic peripheral nerve injury, nerve cell function is impaired. These researchers found that 4AP treatment accelerates repair of myelin damage and improvement in nerve function. Salivary glands, which make as much as a quart of saliva each day, don’t pose a life-threatening risk if they stop working properly. But given their roles — they are important for swallowing, keep the inside of your mouth moist so your cheeks can move around, and have both anti-fungal and anti-bacterial properties — a malfunction would greatly impact quality of life. 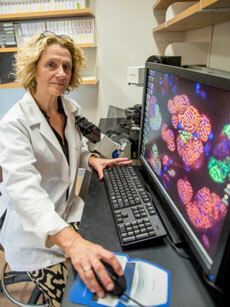 Medical scientist Catherine Ovitt has dedicated her career to the study of salivary glands, in particular to establishing therapeutic strategies for their repair or regeneration after damage from radiation treatment due to head and neck cancers, or because of cellular damage from autoimmune diseases. Cancer cells have their own unique ways of reproducing, involving a shrewd metabolic reprograming that has been observed in virtually all types of cancer but not in normal cells. Now, University of Rochester Medical Center scientists have pinpointed one key source of the problem, which could lead to new treatment opportunities. In an article published by Cell Reports, the scientific team shows for the first time how cancer-causing mutations control and alter the way cancer cells biosynthesize and replicate. The discovery is the result of a close collaboration between the laboratories of Joshua Munger, Ph.D., associate professor of Biochemistry and Biophysics, and Hucky Land, Ph.D., the Robert and Dorothy Markin Professor and Chair of Biomedical Genetics and director of research at the URMC’s Wilmot Cancer Institute. Bowhead whales can live over 200 years, but there is no evidence of a bowhead ever having cancer. "The biggest questions are what are the extra protections that whales have against cancer," says Vera Gorbunova, the Doris Johns Cherry Professor in the Department of Biology. "We would really like to understand the mechanism." In celebration of the NYSTEM-funded training program in stem cell biology at the University of Rochester, researchers convened for a day of presentations and discussions on advances in stem cell biology. To emphasize the excellence of our junior scientists, five NYSTEM trainees (both pre- and post-doctoral, took turns with leaders in the field of stem cell medicine to present their work. The meeting kicked off with a presentation by Dr. Jack Kessler, Northwestern University Feinberg School of Medicine) describing the factors controlling adult neural stem cell maintenance – a key determinant of cognitive health. Dr. Kunle Odunsi (Roswell Park Cancer Institute) spoke in his role as director of the immune-therapy program on the importance of gene-engineered, tumor recognizing CD4 T-cells in anti-tumor therapy. Dr. Angela Christiano (Columbia University) provided an impressive example of the power of iPSC technology with the development of 3D-skin tissue for treatment of such devastating skin diseases as epidermolysis bulbosa. Presentations by NYSTEM trainees Fanju Meng (Biteau lab), Wenxuan Liu (Chakkalakal Lab), Michael Rudy (Mayer-Proschel Lab), Dr. Andrew Campbell (Proschel Labs), and Dr. Nicole Scott (Noble Lab) rounded out a day full of exciting new work that highlights the broad impact of stem cell biology on medicine today – and the success of the SCRMI training program. The meeting was buoyed by good vibes and food provided by the backdrop of the Rochester International Jazz Festival. Thank you to all participants for a great event. See you again in 2017! Catherine Ovitt is one of this year’s three recipients of the 2016 IADR Innovation in Oral Care Awards. She accepted the award from IADR President Dr. Marc Heft at the IADR/APR General Session & Exhibition in Seoul, Republic of Korea. 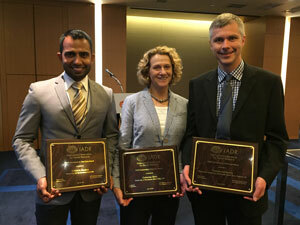 The three prestigious awards recognize research in innovative oral care technologies that may maintain and improve oral health, and are supported by GlaxoSmithKline. 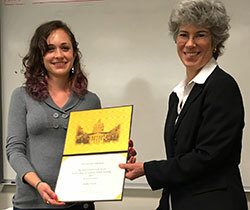 Dr. Luisa Caetano-Davies (Biomedical Genetics) was the postdoctoral winner of the third annual Weiss Toxicology Award. The award was created to strengthen training and research in the Toxicology Training Program by enhancing support of talented future leaders in the field of toxicology, particularly those with an interest in neurotoxicology. The award is presented annually to a meritorious trainee with an interest in Neurotoxicology. Dr. Caetano-Davies is member of the Proschel lab and is studying the effects of environmental toxicants on early stages of Parkinson Disease pathology, in particular with a focus on astrocyte dysfunction. Carolyn Klocke (Cory-Schlechta Lab) was the winner of the graduate student category. Congratulations! GDSC Graduate Nirmalya Chatterjee reports a novel role of Bet proteins in the control of the oxidative stress response pathway. Bet proteins are a subclass of bromodomain containing epigenetic “readers”. These proteins have complex and incompletely understood functions in the control of gene expression and chromatin organization. The human Bet proteins Brd3 and Brd4 have been implicated in cancer and thanks to the availability of specific inhibitors, have emerged as promising drug targets. The paper by Nirmalya Chatterjee, Min Tian and others describes experiments in Drosophila that discovered a novel function for Bet proteins: the regulation of the transcription factor Nrf2. The reported data show that a Drosophila Bet protein is part of a previously unknown pathway that can control Nrf2 activity. This is of interest as Nrf2 plays a prominent role in the defense against oxidative stress, protection against various diseases, and aging. Nirmalya Chatterjee, a recent member of the Bohmann Lab, received the PhD last September and is currently working as a postdoc in the group of Norbert Perrimon at Harvard Medical School. Luisa Caetano-Davies wins “Best Oral Presentation” Award. Luisa, a post-doctoral fellow in the Proschel Lab, received the award for her presentation on “Astrocyte dysfunction in Parkinson Disease” at the 2016 Environmental Medicine and Toxicology Training Program retreat. Her presentation described the use of both iPSC-based disease-in-a-dish and in vivo animal models to identify early astrocyte defects in PD disease etiology. Congratulations, Luisa! GDSC Student Xuan Li publishes on the role of Cdk12 in response to stress. The phosphorylation of RNA polymerase II in the C-terminal domain, or CTD, is an essential step for the transcription of all eukaryotic protein coding genes. The paper be Xuan Li and colleagues describes the unexpected discovery that a certain CTD kinase, called CDK12, is not universally required, but is only needed for the transcription of genes that are inducible by stress, such as heat, DNA damage or reactive oxygen species. This finding suggests that CTD phosphorylation plays a role in the regulation of specific gene expression programs, rather than being a generic step of transcription. This work involved a large-scale robotic RNAi screen in collaboration with the Boutros lab in Heidelberg, as well as genetic and biochemical experiments in the Drosophila model system. Xuan Li, a graduate student in the Bohmann Lab is currently doing an internship at Takeda Pharmaceuticals in Boston and will defend her PhD in November. Cindy (Xiaowen) Wang in the Noble Lab wins 2016 GSS Poster Prize with her work on: Identifying c-Cbl as a critical point of intervention in acquired tamoxifen resistant breast cancer. (Co-authors Jennifer L Stripay, Hsing-Yu Chen and Mark D Noble). Garry Coles, graduate of the Genetics, Development and Stem Cell program received this years du Vigneaud commencement award. The University of Rochester School of Medicine and Dentistry recognizes outstanding post-baccalaureate research efforts and promising PhD candidates through the Vincent du Vigneaud Award, in honor of Vincent du Vigneaud, himself a PhD graduate of the University of Rochester and recipient of the 1955 Nobel Prize in Chemistry. Gary's PhD thesis, entitled "KIF7 and microtubule dynamics function to regulate cellular proliferation and cell cycle progression" focuses on deciphering the role of Kinesin family member 7 (Kif7) on cell cycle control during mammalian development. The work was conducted in Dr. Kate Ackerman's laboratory and has been published in the Proceedings of National Academy of Sciences (PNAS), PLoS Genetics and Developmental Biology. Dr. Wellington Cardoso, Director for the Center for Human Development at Columbia University Medical Center, comments: "I have been closely following the work of Dr. Coles and his mentor Dr. Kate Ackerman, since we share a similar research interest. Dr. Coles has made important contributions to our understanding of the mechanisms regulating diaphragm and lung morphogenesis… I am confident that he will continue to make great contributions to the field in his future career." This outlook is also shared by Dr. Hartmut Land, Chair of the Department for Biomedical Genetics and Director of Research at the Wilmot Cancer Center: "Garry is an incredibly driven and inquisitive scientist, and he has a fabulous enthusiasm for his work…(He) has grown tremendously during his time in graduate school. His maturity and independence are ahead of the curve for most post-doctoral fellows." Dr. Land concludes, "Given (Garry's) exceptional talent to make things work, his curiosity and great persistence, I am certain that he will contribute significantly to any scientific environment... (and)… become a leader in his field". On Friday, May 6th, Andrew Albee opened the 2016 season of Prelim Exams. According to his committee, Andrew passed his qualifying exam with flying colors, and the committee looks forward to the outcome of his work. His studies on the function of Lmx Homeobox transcription factors in early somatic progenitors of the Drosophila ovary are also the basis of an F31 application submitted in February of this year. Congratulations, Andrew! This year's Genetics Day provided another opportunity to celebrate the impact of Genetics on science and medicine. An excellent selection of speakers from the University of Rochester Medical Center highlighted the importance of diverse genetic mechanisms ranging from chromatin remodeling in erythropoesis (Laurie Steiner) and DNA damage repair (Xi Bin) to translational control by riboswitches (Joe Wedekind) and di-codon usage (Elizbeth Grayhack). Genetics Day concluded with the Fred Sherman lecture by Dr. Michael Levine (Princeton University). His presentation on visualizing the mechanisms of transcriptional enhancers was equally entertaining and insightful. Originally from the Hollywood area, and by his own admission a closet movie producer, Dr. Levine wowed audiences with in vivo movies of enhancer reporters, shedding new light on what we all thought was an established principle of molecular genetics. Genetics Day has been a long standing tradition at the University of Rochester And more recently includes the Fred Sherman lecture in memory of Fred Sherman a renowned biochemist and geneticist, who led international efforts to establish the yeast Saccharomyces cerevisiae as the premier genetic eukaryotic model system. The lecture is made possible by a generous fund endowed by Fred Sherman's wife, Elena Rustchenko-Bulgac, herself a research professor at the URMC. We are proud to announce that Heather Natola has been selected to receive the 2016 Edward Peck Curtis Awards for Excellence in Undergraduate Teaching. Ms. Natola received high praise from her students, faculty in the Department of Biomedical Genetics and Rochester Museum and Science Center. Ms. Natola is a graduate student researcher in the Pröschel Lab, where she investigates new therapeutic approaches to spinal cord injury as part of the UR Stem Cell and Regenerative Medicine Institute. "Ms. Natola was particularly instrumental in providing students with in-depth and detailed training, which had a significant positive impact on the student’s engagement and learning"
"Despite her ambitious and demanding research work, Heather has volunteered for all of these teaching activities. Clearly she has not only become an ambassador for science as a whole, but has helped fulfill the mission of our school. What more can we ask of a graduate student?" The findings suggest that the gene’s signaling pathway may be proof that melanoma stem cells exist, a question that’s being debated by scientists. Lei Xu, Ph.D., associate professor of Biomedical Genetics at the University of Rochester Medical Center, is lead author of the study, which was recently published in PLOS ONE and funded by a Wilmot Cancer Institute pilot grant. The Xu lab investigates the multiple, complex steps that occur as cancer cells spread from the original tumor to other parts of the body. The photo shows a blue-stained stem cell and a red-stained stem cell that each generated new bones cells after transplantation. Senior author Wei Hsu, Ph.D., dean’s professor of Biomedical Genetics and a scientist at the Eastman Institute for Oral Health at theUniversity of Rochester Medical Center, said the goal is to better understand and find stem-cell therapy for a condition known as craniosynostosis, a skull deformity in infants. Craniosynostosis often leads to developmental delays and life-threatening elevated pressure in the brain. For years Hsu’s lab, including the study’s lead author, Takamitsu Maruyama, Ph.D., focused on the function of the Axin2 gene and a mutation that causes craniosynostosis in mice. Because of a unique expression pattern of the Axin2 gene in the skull, the lab then began investigating the activity of Axin2-expressing cells and their role in bone formation, repair and regeneration. Their latest evidence shows that stem cells central to skull formation are contained within Axin2 cell populations, comprising about 1 percent—and that the lab tests used to uncover the skeletal stem cells might also be useful to find bone diseases caused by stem cell abnormalities. The National Institutes of Health and NYSTEM funded the research.